A paper is a fixed part of the scholarly literature, with a unique citation and the credibility that comes from being peer-reviewed. It will be aimed at a niche audience of other researchers, but will count towards the authors’ prestige, including the formal research assessment processes that shape their careers. A publicly-editable Wikipedia article lacks that guarantee of reliability, but has benefits of its own. Being editable means that it can change to reflect new knowledge. Readability is enhanced by linking terms to their own explanatory articles. With Wikipedia being massively multilingual, an informative article can be translated into other languages. It may reach a very wide public audience, informing them about theories or discoveries and showing them how a subject is researched. For a researcher, contributing to Wikipedia may benefit their discipline as a whole by informing current and potential students and the wider public, yet it takes time away from activities that get career recognition. PLOS Computational Biology, one of the Public Library of Science family of journals, is enabling authors to publish both a paper and a Wikipedia article. It invites submissions of review papers on a specific topic or research technique that has no article, or a very scant one, on Wikipedia. These Topic Pages summarise existing knowledge rather than reporting fresh research, so they have the same scope as Wikipedia articles. PLOS uses an Attribution only licence which allows papers to be freely reproduced and adapted for any purpose. The shared scope and open licence allow Topic Pages to be copied into Wikipedia. Thus the Topic Page on Circular permutation in proteins, published in PLOS Computational Biology and visible in the relevant citation databases, can also be read on Wikipedia. It is one of six to have gone through the process by the end of 2013, with four more being drafted. The Wikipedia community have made their own review and edits, in this case expanding the introduction to tailor the article to the site’s lay audience. The Wikipedia articles are badged with a full citation indicating the source of their text. The biggest challenges for authors, according to Mietchen, have been keeping within Wikipedia’s policy on neutrality and its requirement for an accessible lead section that summarises the whole paper. As happened with the Circular permutation article, copying into Wikipedia is one way to crowd-source accessible prose. These re-uses of open access papers are examples of what is called Journal-to-Wiki publication, but the Topic Pages are themselves written by a Wiki-to-Journal process. They are developed on the journal’s own wiki, which is publicly readable but only writable by the journal’s contributors and reviewers. This is built on the same free, open-source MediaWiki software that underlies Wikipedia and the other Wikimedia sites. Wikipedia’s extensive policies and Manual of Style also guide the Topic Pages, ensuring their compatibility with Wikipedia. As Topic Pages develop, they are reviewed using the on-wiki discussion tools. On publication of the article, these reviews are pasted into the Wikipedia talk page. This has meant some changes for the journal, including taking submissions that come via MediaWiki and that include figures in Scalable Vector Graphics format. Both the journal and Wikipedia versions of a Topic Page include links from key terms to their Wikipedia explanations, which improves the accessibility of the paper for a broad audience (including researchers from different areas of expertise) while simplifying its conversion to a Wikipedia article. 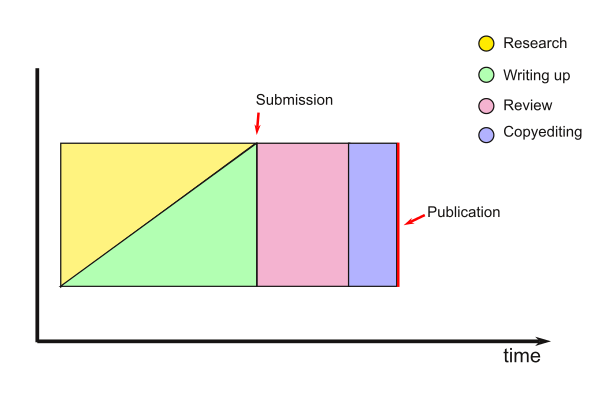 Academic publishing traditionally works by a linear model: research, write-up, review, editorial decision, copy-editing/proofreading, and publication happen one after another. In Wiki-to-Journal publication, these are concurrent. Informal review and copyediting can happen as soon as there is any text, and any time from then on. 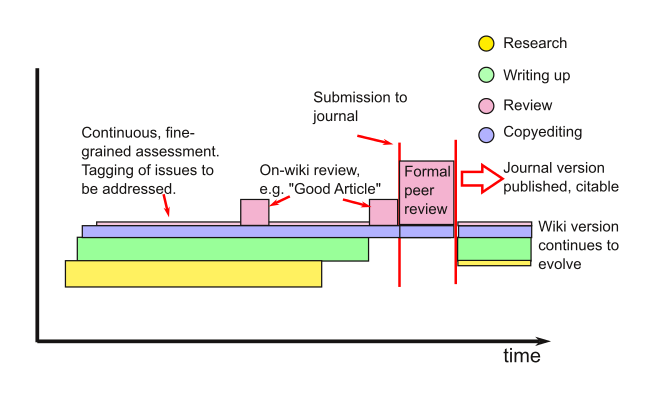 When the on-wiki participants agree the article is ready for publication, it can be passed on for formal peer review and publication in a citable journal, but the on-wiki version can evolve to reflect future research (Figure 2). This is the model of JMIR Wiki Medical Reviews, a new peer-review journal intending to publish medical review papers that have been written and initially reviewed on Wikipedia. 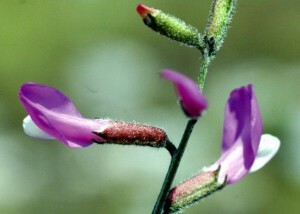 PLoS Computational Biology is a journal of the International Society for Computational Biology (ISCB), and Topic Pages are not the society’s only Wikipedia activity. They also run a competition in which students and trainees choose an article to expand over a four-month period. With Wikipedia articles being classified by subject and quality, there are lists of computational biology articles that are ripe for improvement, as there are for other subjects. Participants register their chosen article title and their Wikipedia username on a public noticeboard. After the four-month deadline, a panel – combining academic and Wikipedia expertise – review the improvements. Wikipedia’s “Article history” feature can identify improvements across a specific time period or by a specific user. The three most improved articles win cash prizes from the ISCB. In the 2012/13 competition, these included the article about crowd-sourcing project Rosetta@home. So creating articles on-wiki will be difficult culturally and technically for some expert groups, but there are ways to close this gap. On the one hand, scholarly institutions or events can benefit from training events such as “editathons”. On the other there are improvements to Wikipedia itself, such as the Wikimedia Foundation’s development of a visual editor. Post written by Martin Poulter, the Jisc Wikimedia Ambassador. Many thanks to Daniel Mietchen for his co-operation with this case study.